The present state capitol building of Louisiana, located in Baton Rouge, will forever be entwined with the political career of Huey Pierce Long. It was Long's idea for the state to construct a new building for the statehouse in 1928 when he was running for Governor of the State of Louisiana. The construction of the building was part of his political platform, as well as the notion to place the state capitol on the site, which was once Louisiana State University and formerly a military post known as the Pentagon Barracks. Included was a strip of land on which the Arsenal Museum was located. Long had contracted with a New Orleans architectural firm, Weiss, Dreyfous and Seiferth, to design the building. Next, Governor Long had pushed through an amendment which financed the new capitol by the end of the 1930 Legislative Section. Within 36 days of the completion of the final design, actual construction by the George A. Fuller Company of Washington, D.C. had begun. The construction work took only a year and a half to complete and the dedication was coordinated with the inauguration of Oscar K. Allen as Governor on May 16, 1932. Ironically, Long was not present because he had been elected to the U.S. Senate and was in Washington, D.C. 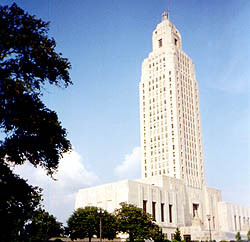 The Louisiana Capitol, a 34-story, 450-foot Alabama limestone-clad skyscraper, is an excellent example of a greatly simplified classicism with Art Deco details that were in vogue for monumental buildings in the late 1920s. Only two other state capitols had been built with this design and its 34-story frame is to date unrivaled by any other building in Louisiana. The tower is decorated with important groups of sculpture representing the history of the State. 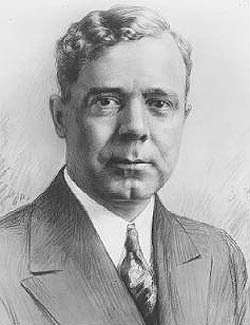 Long was assassinated in the Capitol Building, the building for which he fought to be constructed and used as the state's government seat, and died on September 10, 1935. However, he was fittingly buried in the center of the public Capitol Gardens on the State Capitol's grounds. His memorial, a statue showing him in front of a model of the capital, stands proudly in the English Garden in the shadow of the skyscraper that was part of his political platform for governor. The Louisiana State Capitol, a National Historic Landmark, is located at N. 3rd St. on State Capitol Dr., Baton Rouge. It is open from 8:00am to 4:30pm, daily, except on major holidays. There is no fee for admission. For further information, please call 225-342-7317.